The public has no input going forward on this piece of land. The CMA and the Township are in business together to redevelop the area, and neither could give a rip about how residents feel about it. But I do think there should be some sort of investigation about the decisions that permitted the building to survive after Sandy. Who would do that? Certainly not the Township, who has less than no credibility. Maybe the state entity that assigns the director of code enforcement to the Township could get involved. I would like to know how permits were issued when some experts thought the building should be torn down. Let’s hope for the best solution. Was there any fire suppression in the building? Looking for clarification. The CMA may control access to the beach and maintain it, I don’t believe they ‘own’ it. This lot is on the beach, on the sand, I don’t understand how they can develop it or even lease it.. The CMA owns the beach and 1500 feet out into the ocean under a deal with the Federal government in the 19th century. Who knows if it is enforceable. It was the State Assembly that granted the OGCMA the right to prevent people from landing on its beach, not the Federal Gov. This was to uphold the OGCMA’s blue laws which the State later removed through a law suit. The North End pavilion was an accessory use to the primary use, the North End hotel, since it was not built on a road way, which the law requires for a primary use. I doubt that either state or federal law will permit the rebuilding of the structure since the MLUL requires that any structure must border a roadway and must provide parking. Neither of which this property can meet. The Pavilion Building was owned by Maplewood OG Associates. The Boardwalk is owned by the CMA. The land underneath (the beach) is held in trust by the State of NJ under the jurisdiction of the DEP and reserved for recreation and conservation and is Public Open Space. Anything rebuilt must be incidental to the recreational use of the beach. 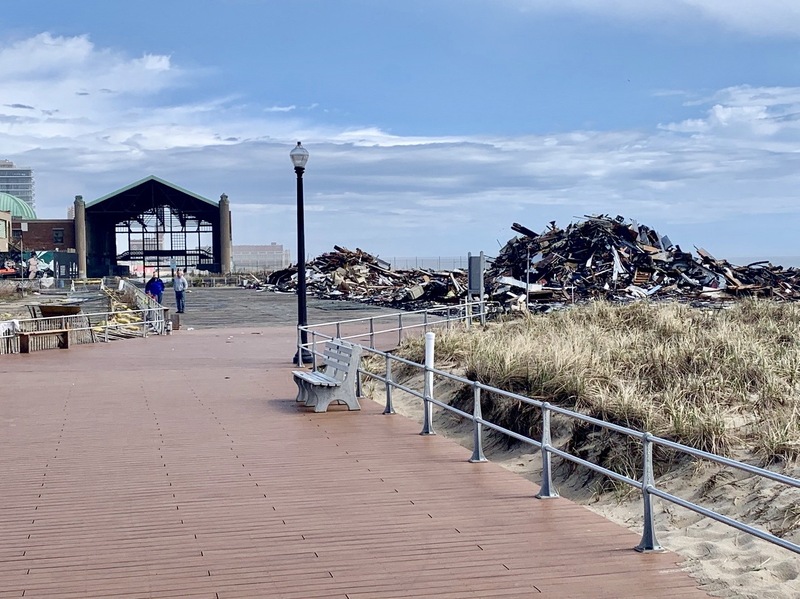 Based on an interview with Jack Bredin: One could say that only the Neptune Committee should be handling the situation at the fire site, because that Pavilion is part of the “Area in Need of Redevelopment” (NERP 2007) which is a public project under the jurisdiction of Neptune Township. This may sound like a technicality, but it is another example of Neptune Township and its redevelopment allies twisting the NJ Land Use Laws. The CMA signed off its role as a redeveloper, but does its involvement after the fire indicate that it wants in again? Could you explain what this mean? I though the CMA owns the beach outright down to the mean high water line? Wouldn’t this property be subject to a 99 year lease like all other properties in OG? Joe, as a land surveyor, you must know that the beach in Ocean Grove is part of New Jersey’s riparian lands and cannot be zoned by the township. The “mean high water line” you refer to on the beach changes with each northeast storm and cannot be used to determine property ownership or lot lines. Property ownership is recorded in a deed from information by a land surveyor like yourself in “meets and bounds” that determine the lot lines of a property, and the lot lines are used to establish front, side , and rear yard requirements of municipal zoning. In order to use beach property for residential or commercial use, as the Pavilion property is zoned by the Township, the property owner must first have a riparian grant or permission from the DEP attached to the deed and filed with County, and the lot must front on an approved street. Only the State can lease riparian lands, not the CMA, and the lease payments would go to the State. The restaurant can be rebuilt at the proper elevation, but only the Tax Collector would encourage rebuilding the 9 unit commercial building, as property taxes go to the Township.